On July 2nd, 2018, Kaixuan Ni of UC San Diego presented the recent results and the current status of the XENON1T experiment at the 6th Symposium on Neutrinos and Dark Matter in Nuclear Physics (NDM 2018) in Daejeon, Korea. The recent released results from XENON1T set the world’s most stringent limits on the WIMP-nucleon spin-independent interactions for all WIMP masses above 6 GeV. The detector currently keeps taking dark matter search data with improved detector performance and with reduced background. An upgrade of the detector to XENONnT is scheduled in 2019. 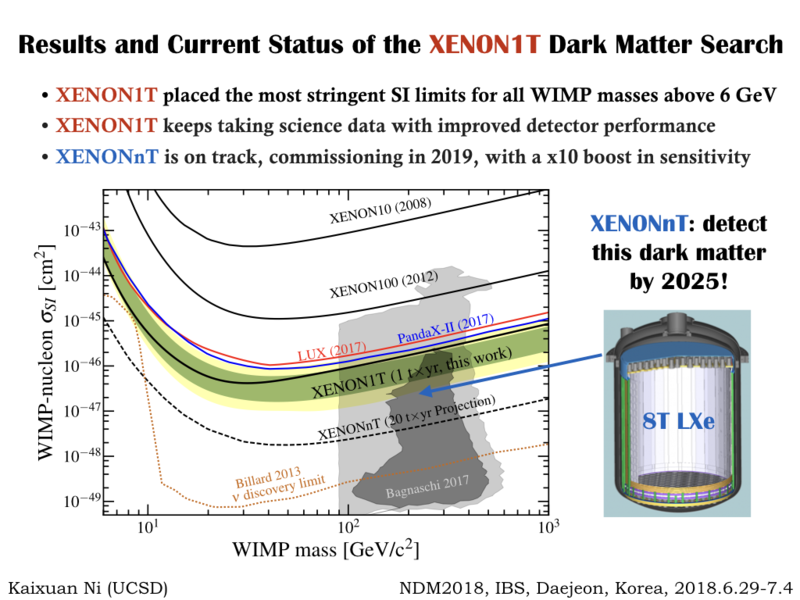 With a total of 8-tonnes of liquid xenon, XENONnT will boost the dark matter search sensitivity by a factor of 10 and is targeting at dark matter candidates from the supersymmetric models. This entry was posted in Talks on July 20, 2018 by Kaixuan Ni.